This ACAManager update includes: ACAManager is now a Standalone Product, has a newly added Import Template, updated 2016 Employee/Employer 1095-C/B and 1094-C/B Forms, an added Address Page for Mailing, and many more! ACAManager is now a Standalone Product! As a product of these efforts, ACAManager now offers an implementation solution that is independent of the benefits administration and enrollment side of the platform. This functionality provides the ACAManager user with the opportunity to setup and creates a company within ACAManager without requiring them to have an existing company within the benefitsCONNECT platform. As a value add, the user is removed from having to set up the hearty benefits administration section such as plan specifics, payroll schedules, waiting periods nor enter all rate tiers and age bands. Married with this functionality is a single import solution which allows users to complete the majority of the implementation with one file upload. Not only does this offer minimization of setup, but it provides an opportunity to easily override employee eligibility and enrollment records as a means to manipulate the code output where needed. The import includes sections for Divisions, Demographics, Employee Status, Eligibility, Enrollment and Covered Dependents. This template permits users to define eligibility, enrollment, and status for employees as well as identify covered dependents when a plan is self-insured. · Transition relief currently provided for the Employer Shared Responsibility payment for large employers, those with an average of 50 or more full-time equivalent employees during the prior year, expires January 1, 2017 including non-calendar year transition relief. All Applicable Large Employers (ALEs) are now required to offer compliant coverage to employees or face penalties. As a result, the Transition Relief button will not be available for 2016 creation but will be viewable for 2015. Employee Control List for Forms Download: When downloading all the forms for a group you will be presented with a control list that will detail all the employees that have a form within that group. The list will contain the: Company ID, Employee ID, Name and EIN for every employee included in the downloaded file. This should serve as a receipt and a means for tracking which forms were produced and when. It is important to note that forms being submitted to the IRS should NOT be masked, but those submitted to employees can be. New Address Page for Mailing The 1095-C/B, 1094-C/B Forms! Whether reviewing a single employee form (via the Employee IRS Report List) or downloading all employee forms in mass for printing (via the Employee Download Forms page), each employee form will have an address cover page. 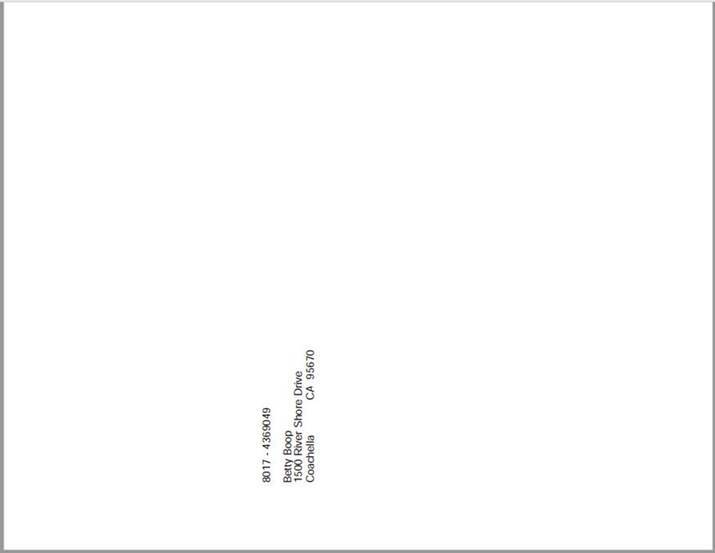 This page is designed to fit into a 9x6 envelope with a half-page fold. It also includes the Company ID and Employee ID to ease the management of the printing and distribution process. Removed Delete Everything button – this was removed as too many people were inadvertently deleting their data. Second Confirmation Page– this was added as a modal pop-up. This gives users the opportunity to confirm the action they’ve selected to take. This was implemented to help prevent error in selecting an option that was not intended. *For those clients that have decided to e-File with us and have already remitted payment for the e-Filing service, there is a report available in the Internal Admin section of ACAManager that will provide a list of every employee receiving a 1095-C form and the codes that will be generated on their form. These will be the same codes that will ultimately be filed with the IRS. 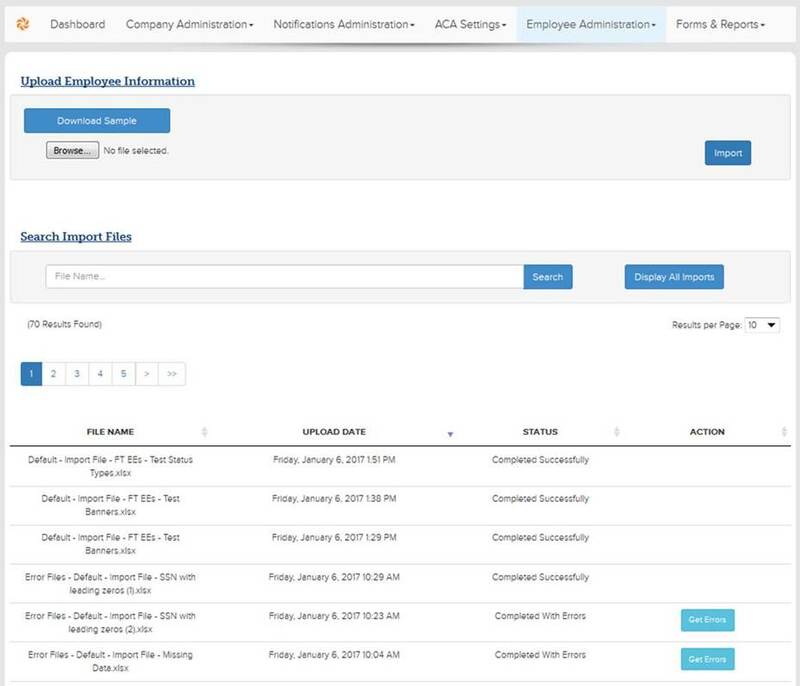 This allows for a quick and simple way for employers to review the codes being generated for their employees prior to filing electronically with the IRS via ACAManager.